Letting the angels call Tails or Heads. In Heaven, where everyone is always right? you child of the sheltering sky. Where did you get that hair, those blue eyes? is that why you scoff at us? as if to demonstrate how much remained to be done. and now must be counted again. he grows strong off his need for others. and the night grew pale. the earth is strong enough without them. Emerging all unbidden underneath an umber sun. You geese in the air and you quails on the ground! You may go as you like; only quietly go. Not a chirp from you blackbirds who quarter the sky! She’ll awake and demand you be baked in a pie! so there’s always that chance. The poet went out on a sunny day. Until his feet were sore. 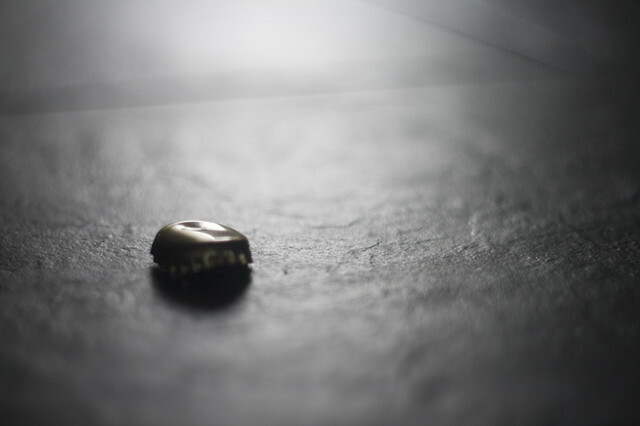 Image: Beer Cap, by Jim Titulaer, published under a Creative Commons Attribution-ShareAlike 2.0 Generic (CC BY-SA 2.0) license. Made sense to sentence bow. A chance, then, not to take. And latterly the language is grown askew. and drank and danced and sang. wouldn’t go back to where they came. They’re out carousing now no doubt. Oh hell, oh where’ve they gone? Oh what were we talking about again? Oh when did we lose track?